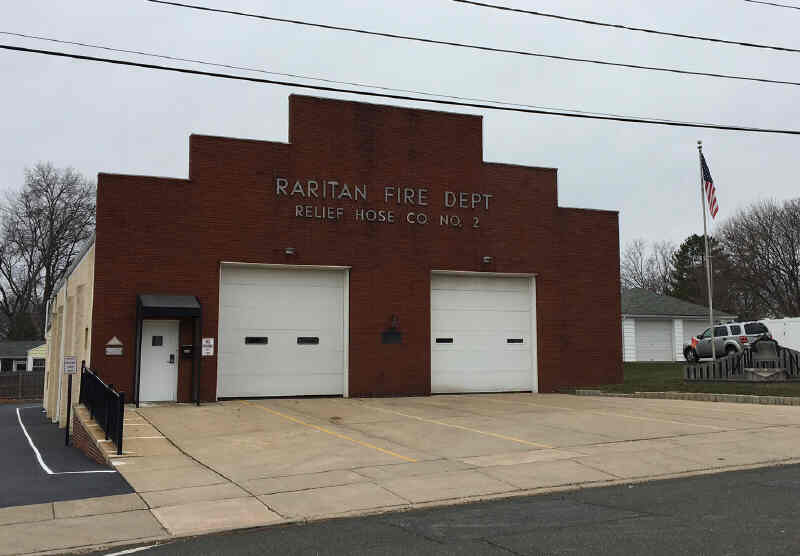 The Raritan Fire Department has been an integral part of the town since its beginning. So it seems fitting that the earliest surviving story in this town is about the Fire Department. It comes from a booklet written by one of Raritan’s Founders Chris Ehni. In his book we see a picture of the origins of both the town and the Fire Department. In 1847 the town of Raritan was emerging. A canal to help businesses had just been completed along the river. Seven years earlier the streets had been laid out and the land had been partitioned into lots. A few businesses were already along the Canal/River and buildings had begun to spring up along the main road. The “Village of Raritan” as it was called wanted to grow and prosper. To do this they needed to attract both business and residents. One of Raritan's early vehicles. Note that is says "Relief Hose No. 2" on it. Raritan still has this vehicle today. At this fire the passing of buckets of water was no match for the inferno that would soon destroy that building and a couple next to it. 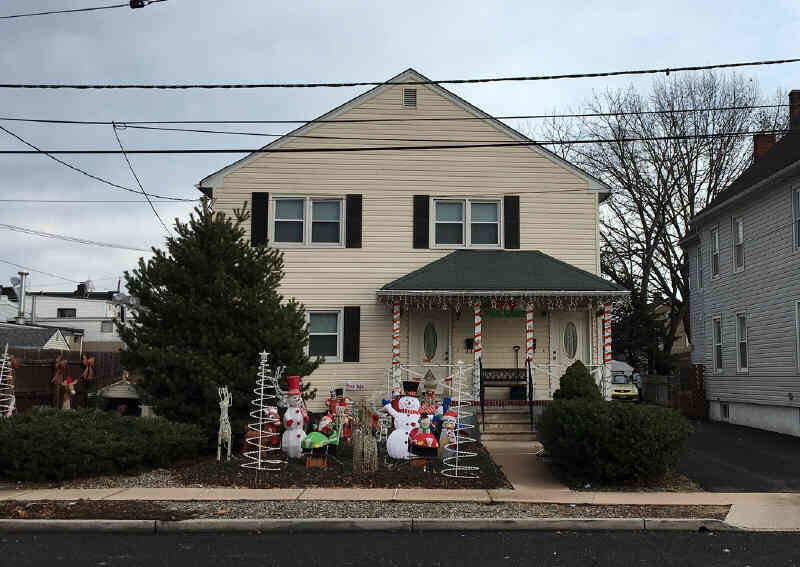 The residents of Raritan knew that a village that could not control a fire was not a place that would attract business. 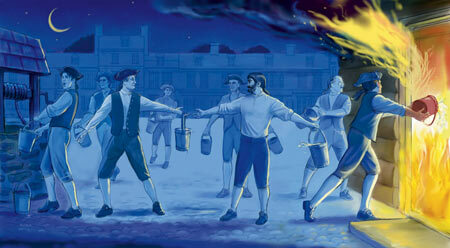 Especially in this era as “fire” was a constant threat that often destroyed property. Bucket Brigades had their limitations. In response to this fire that should have been contained, but was not, the residents of Raritan created the first Raritan Fire Department. They would obtain some long hoses and a “hand pumper” to move the water from a water source (well or canal) through the hose. 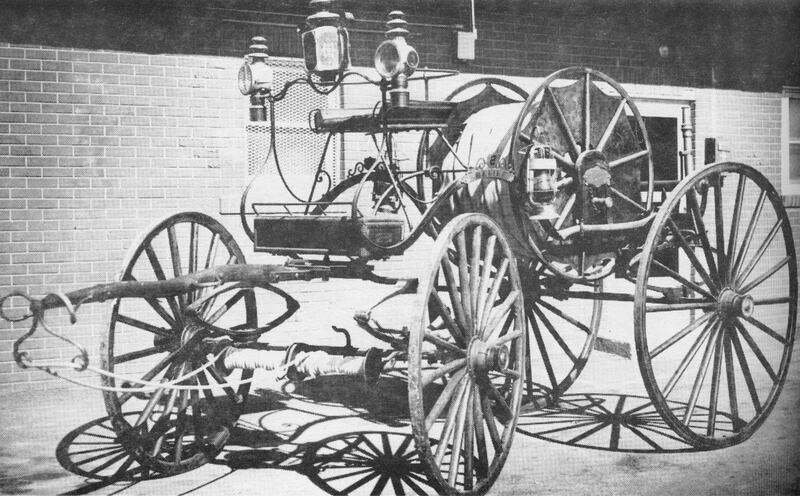 With no practical power sources back then it was necessary for several fire fighters to vigorously push and pull the handles up and down on the pumper. This was exhausting teamwork that required the constant rotation of men. To keep everyone enthused and active in this new fire company they made a decision to make the fire department a social center for many activities. location on Wall Street. No photos exist. Despite a well-organized start, in a few years the fire company became undisciplined and unorganized. Practices were seldom and equipment was in poor condition. 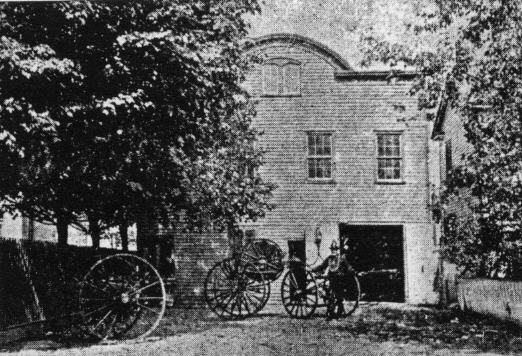 Thus a younger generation of men in a coup organized a new fire department that they called “Washington #1” and asked the residents of Raritan to support the new company. The “Lafayette” guys initially were furious, but gave in after a few days. 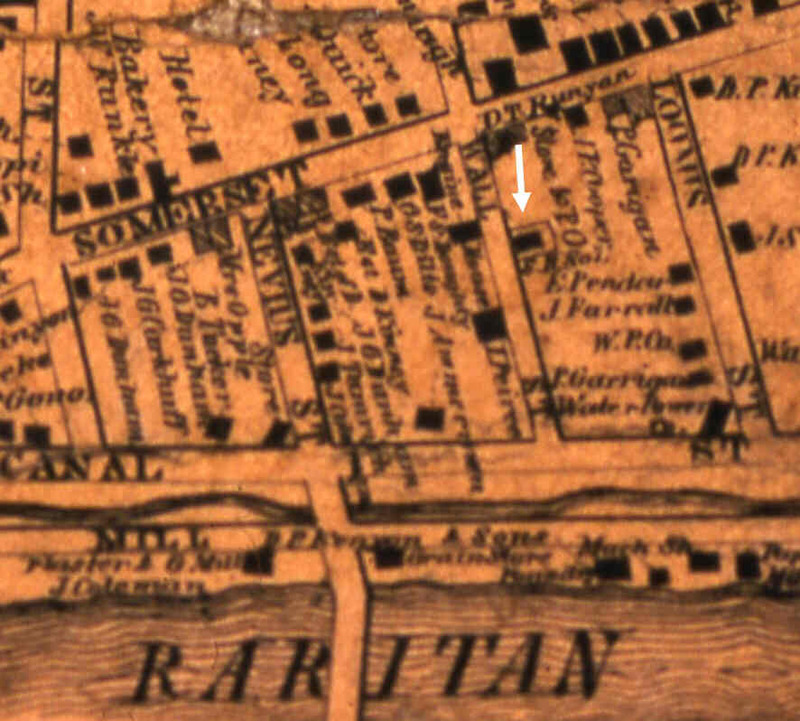 first firehouse is shown on this 1860 map. 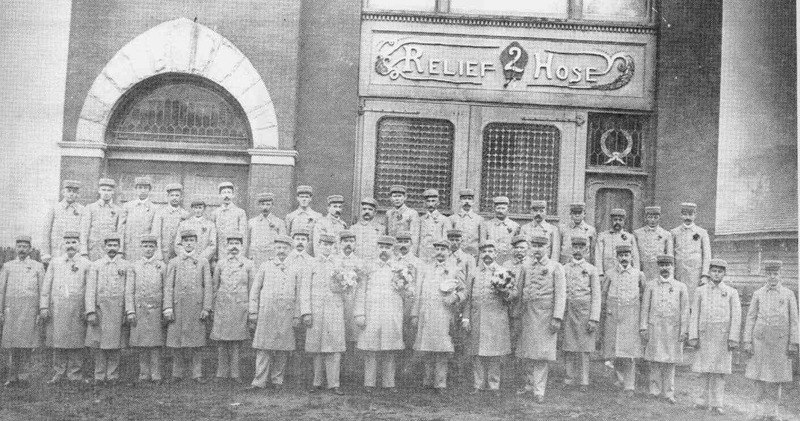 In 1870 they changed their name to the “Relief Hose Company”. By 1872 they would move their firehouse to another building on First Street by today’s Municipal Building where the trailer for the police department is located. The second Fire House is shown above. Below is that location today. 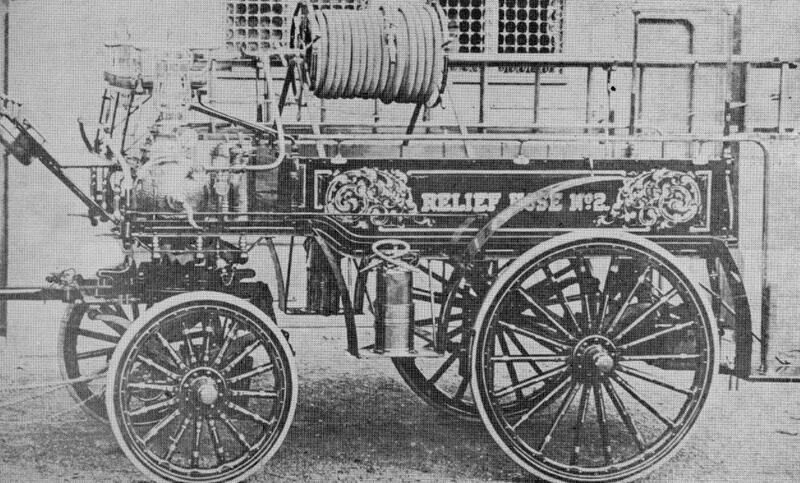 In the 1870s the Fire Company continued to obtain modern equipment (of the era) when it purchased a four wheel Leverich Hose Wagon. (Today’s Fire Department still has this one as well.) That wagon was heavy and it required that it be pulled by men (or horses) by ropes in the front. 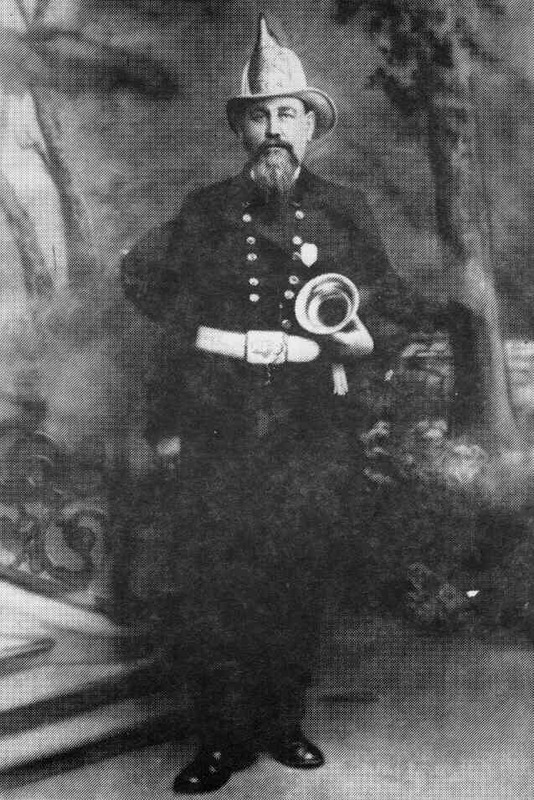 This was a setup that proved to be fatal as in 1874 a Raritan Firefighter Stephen Conklin fell while pulling the wagon to a fire and was crushed to death. In 1883 fire fighting in Raritan improved dramatically as underground water pipes with above ground fire hydrants were installed throughout the town. A pressured water source could then be found on many corners. New hoses that worked off of the hydrants were obtained. In 1892 the town of Raritan decided that both the government and the Fire Department needed a sizable permanent building to operate out of. Thus they built a new fire house on Anderson Street. 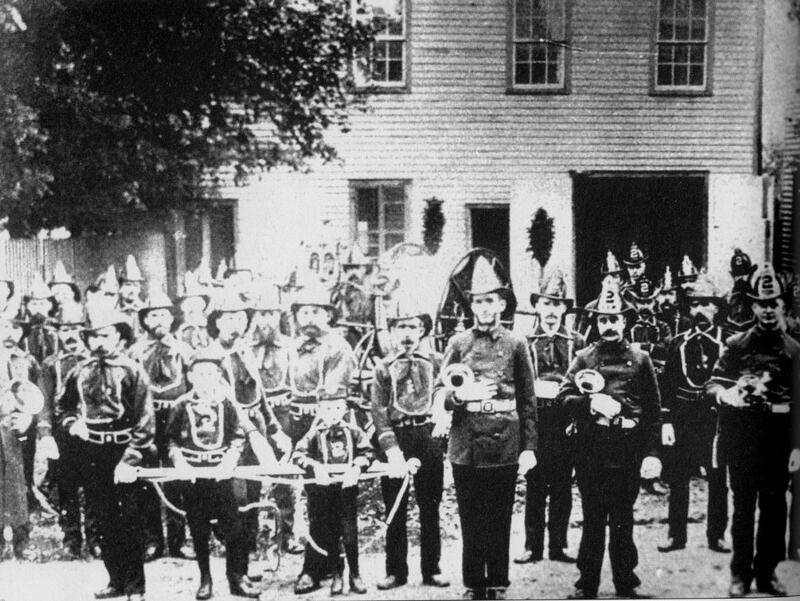 On May 10th 1894 in a festive ceremony the fire department marched from their old location on First Street to the now built Anderson Street Firehouse. Legend has it that the old building was moved to Second Avenue and converted to a two family home. But what house that is has been lost to history. 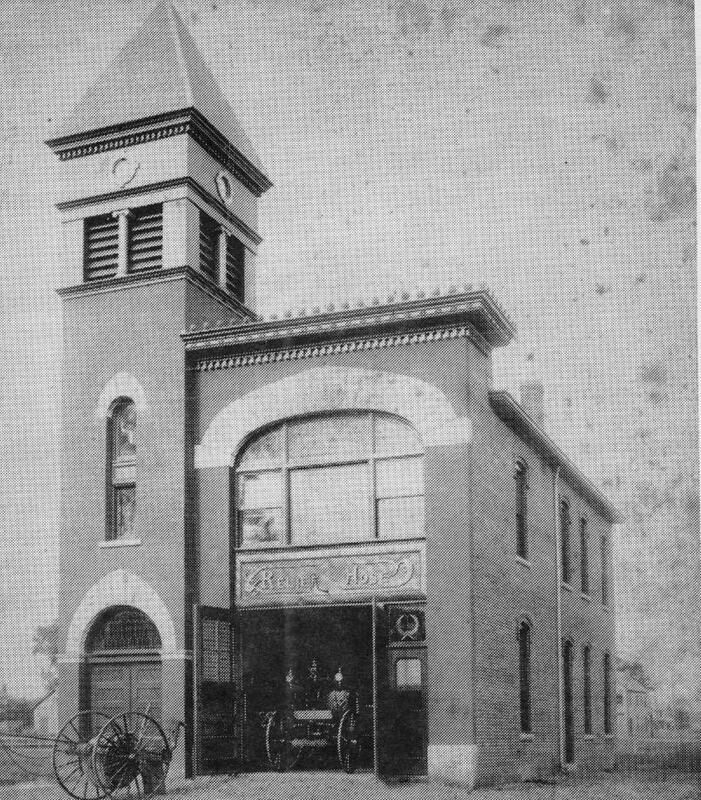 The Anderson Street Firehouse when it first opened. Once the Anderson Street location opened the town extended First Street all the way to Anderson Street right in front of the firehouse. This would allow the fire department to immediately head west when needed. 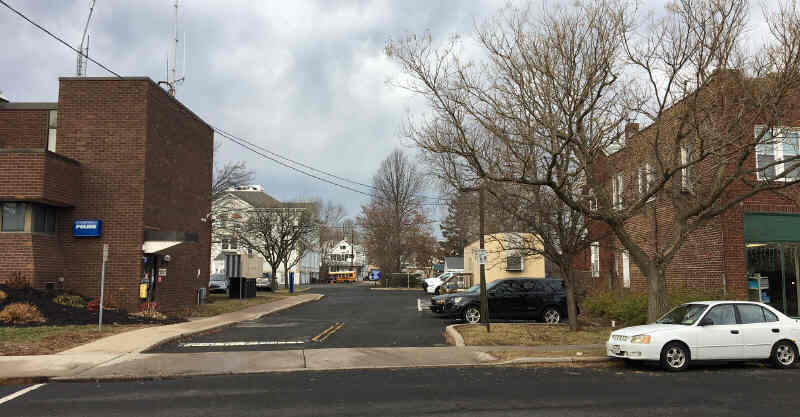 To improve response times Fire Alarm boxes were installed around Raritan. These boxes would send a telegraph signal to the Anderson Street Firehouse where a control system would automatically sound a fire whistle. Each alarm box signaled the controller with a unique identifier so the fire whistle would ring a sequence of blasts to identify the zone where the fire box was pulled. The fire fighters in Raritan (along with the residents) had charts posted in their homes that showed where each zone was so they would know where to go. Throughout the first half of the century the Fire Company continued to be a social center for activities. From 1896 into the 1900s they ran a well-attended annual trip to the Coney Island Amusement Park. In addition there were fireman’s parades that went through town. In the later years they held an annual dance on Easter Monday. 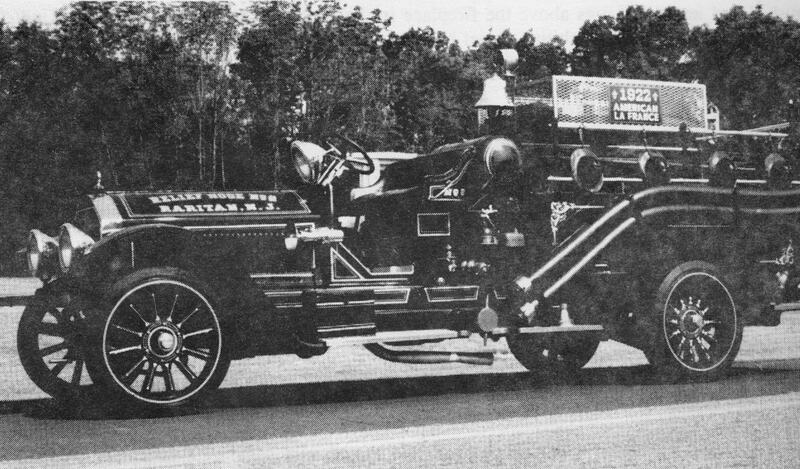 In 1922 the Fire Department obtained a motorized vehicle. Thus the days of the horse and / or people powered fire vehicles were over. The fire department still has this today. After World War II the fire department and the government began to clash in the sharing of common areas at the Anderson Street Firehouse. In the beginning years the fire department had priority in the building, but the government’s increased needs relegated the fire department to a second class status. The fire department also needed more space for the now larger firetrucks. In 1955 it was decided that another spacious firehouse used exclusively by the fire department was needed. A lot on North Thompson Street was obtained and extensive fundraisers were held. Many businesses and even fire fighters themselves provided free labor to see the project completed. In October of 1959 the new firehouse was complete. That firehouse along with the old Anderson Street Firehouse are still used today.